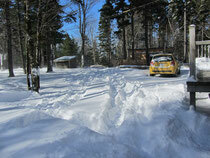 Snow Storm Nemo - julia-in-nova-scotias Jimdo-Page! just a quick update, because I feel like I have to write something although I don't really know what. So I'm here for more than 5 months now and it feels weird. Time's flying too fast, as I said in the other blogs too! Saturday and Sunday we had the big snow storm named Nemo, maybe you heard about it on the news and it brought us about 51 cm of snow. I haven't seen that much snow before and it was just amazing, pretty and a lot! It was storming quite hard and it will probably take a while until everything's melted. Thursday we had a school dance and it was a lot of fun again. I dressed up with my two best friends and we had a blast! The only bad thing was that I had to leave early, because I had the flu. Yes that meant spending the whole weekend on the couch with my whole family, cause we were all sick. Watching movies, drinking tea and not speaking much. Awesome weekend, eh?! This week is Valentine's Day and I'm really excited for what they're gonna do here, because it seems to be quite a big thing here!